Welcome. Your student experience is about taking on new challenges and meeting new people, exploring opportunities for yourself and discovering who you are. There are many resources and people in Student Services who can help you on your journey - please take advantage of all we have to offer. Fáilte. Is éard atá i gceist le bheith i do mhac léinn glacadh le dúshláin nua agus cairde nua a dhéanamh, deiseanna éagsúla a chíoradh agus eolas a chur ar an sórt duine thú. Is iomaí acmhainn agus seirbhís a chuirtear ar fáil mar chuid de Sheirbhísí do Mhic Léinn chun cabhrú leat ar an aistear sin – molaimid duit leas a bhaint astu. "Student Services is an integral part of the University community, enabling the promotion and development of its educational mission. Using a holistic approach, we offer a range of clearly defined services to support and empower students to achieve their personal and academic potentials and so enhance their life's journey. We strive to create a community which is open and caring and where diversity is expected and respected." The opportunity to expand horizons in cultural, sporting, volunteering and social pursuits, is a valuable part of student life in Maynooth University. Our team encourages students to participate in some of the many sporting and society activities available in this vibrant and inviting campus. 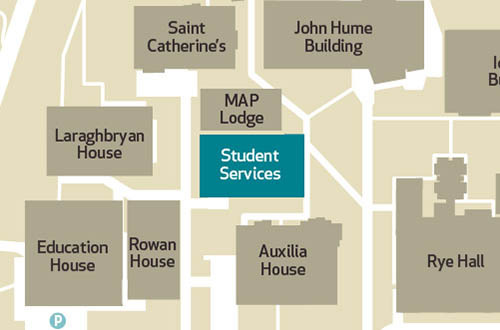 The Student Services Office is located on the North Campus.